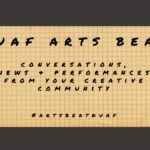 The Arkansas Arts Council awarded me with a grant to study at The University of Arts London (UAL) in the UK. For more information about this University check out this link. UAL has been ranked as one of the top International Art & Design schools for several consecutive years. The course ‘Anatomical Portrait Drawing’ was a week long and it was held at Central St.Martin’s College at UAL (click here for more details about the college). This college was founded in 1854! I felt honored and very excited to attend this University. It was a fabulous opportunity in one of my favorite cities. I arrived in the UK on Saturday August 19 around noon, I was blurry eyed and tired after a long flight but that didn’t stop me from throwing myself into this trip! I stayed in Surrey, which is on the suburbs of London. My first day was spent trying to stay awake until at least 7 p.m, so I could somehow quickly adapt to the UK time zone. That day was perfect for catching up with my family, light retail therapy and then unpacking my suitcase. 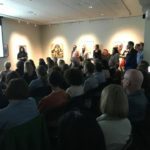 After a good night’s sleep, and on my first full day I went art shopping with my sister (photo of us shown in the slideshow above). We drove to Southall, which is on the suburbs of London. 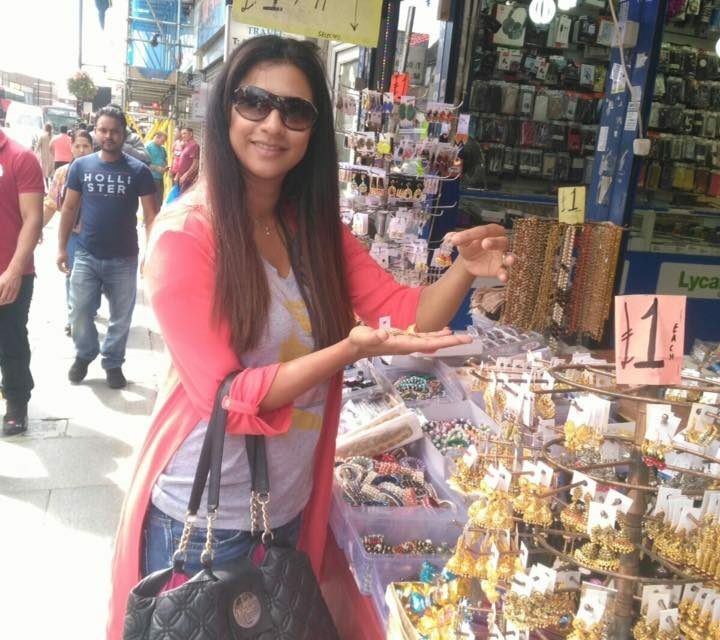 The main High street in Southall has a wide selection of South Asian (mainly Pakistani and Indian) shops and markets that sell clothes, accessories and there are lots of amazing restaurants to choose from. Being slightly restricted in Arkansas, I have bought various props for my art in Bentonville, AR and online. 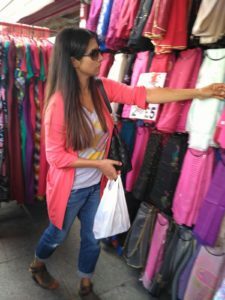 Shopping online exposed me to lots of options but it never compares to shopping for something in person and having the chance touch, see and feel fabrics and accessories. I really wanted to shop the markets and shops in this part of London where I would have an abundance of choice and easily find what I want. In Southall, we stopped off for lunch at a restaurant that was owned by a family from Lahore, Pakistan. The food was fresh, they made tandoori bread in a clay oven in the kitchen. The smell of fresh tandoori bread or roti always brings back childhood memories. I remember my mother making fresh roti (or chapatti) for each evening family meal, she would knead the dough, then by hand create a dough ball and with a rolling pin she would roll out each roti (bread). The roti would then be placed on a dry, hot pan, where it would cook and eventually it would be placed over an open flame to finish baking it. The smell of fresh home cooked roti would spread in the house. It amazing how certain smells trigger off detailed memories? 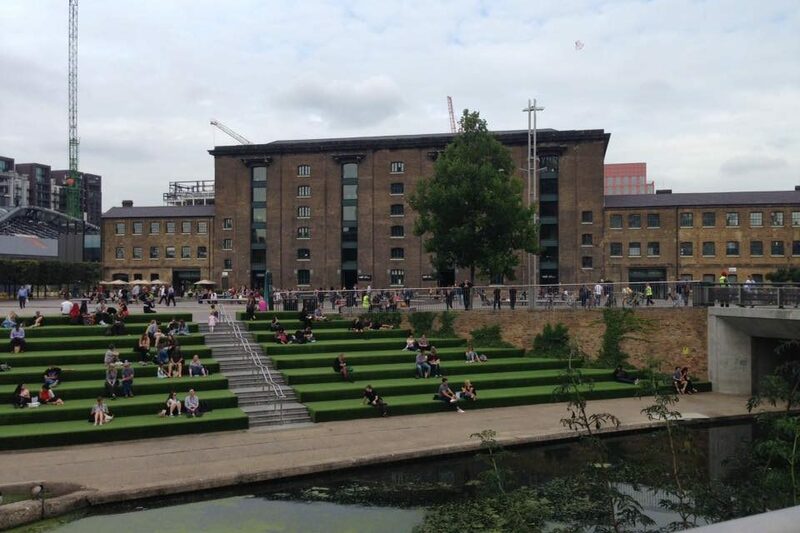 On Monday morning, I began my course at the University in Kings Cross. It was great being back in London again. The busy underground (subway) , the feel of things moving at the pace they used to when I lived there. My whole time in the UK was unusually sunny! English weather is typically grey clouds and rain. I was fortunate this time, I felt like I had taken the Arkansas fall weather with me on my travels! My campus was located in an old converted warehouse, the college building itself was amazing to see and tour. There were water fountains outside the building, a river running alongside it and a space for food vendors to set up for lunch. See photo’s above. From Monday to Friday, 10am to 4pm I studied alongside 13 other students who had travelled from Canada, India, Malta, Lithuania and various parts of the UK. We worked from live models each day and were taught various skills and the importance of anatomical structure of the human body. I learned so much, not only from my instructor but also my class mates. We switched easels and workspaces 2-3 times each day. So I managed to have a work space alongside everyone at some point and have a different view of the model throughout my time. One of my challenges I had, was to stand up and be on my feet for the whole duration of this workshop. We stood in front of our easels as we worked. In my home studio, I rotate between sitting and standing. My time at UAL, went very quickly. After I completed my art course, I had time to tag on some days where I could relax and explore London. On the very last day I found time to take the train back into London again and visit the National Portrait Gallery (NPG). 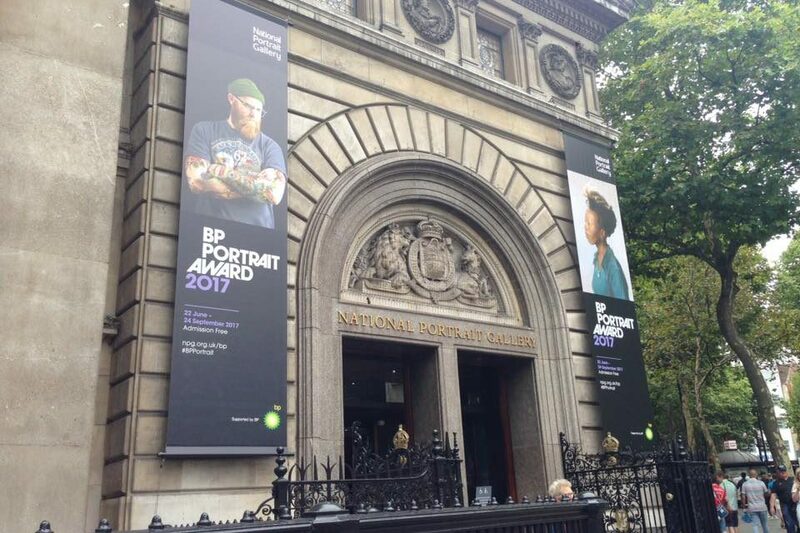 I was in luck with timing, they were exhibiting work that had been accepted into the annual BP Portrait awards. 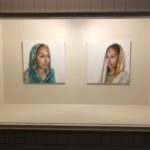 I loved spending the afternoon, looking at each piece up close, studying small details and learning about the artists and their inspiration or story behind their work. 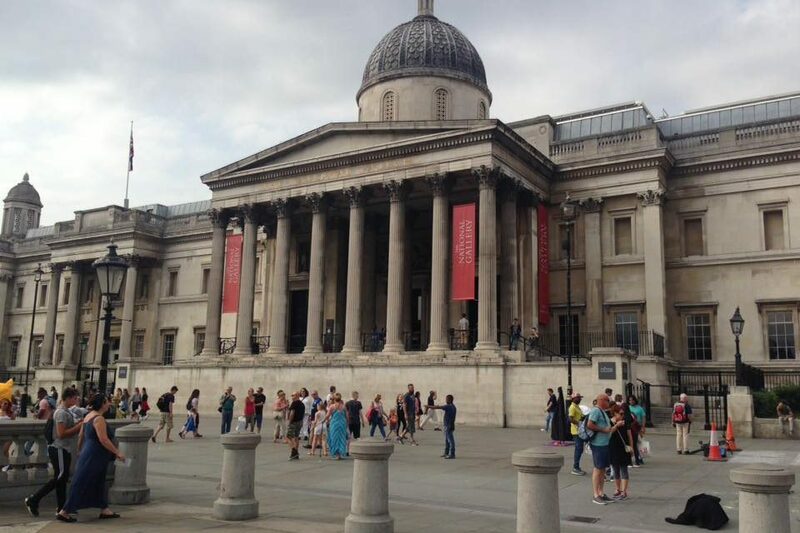 When I finished in the NPG, I walked to Trafalgar Square and soaked up the touristy atmosphere there. It’s one of those things I really didn’t do in all the time we lived in London. 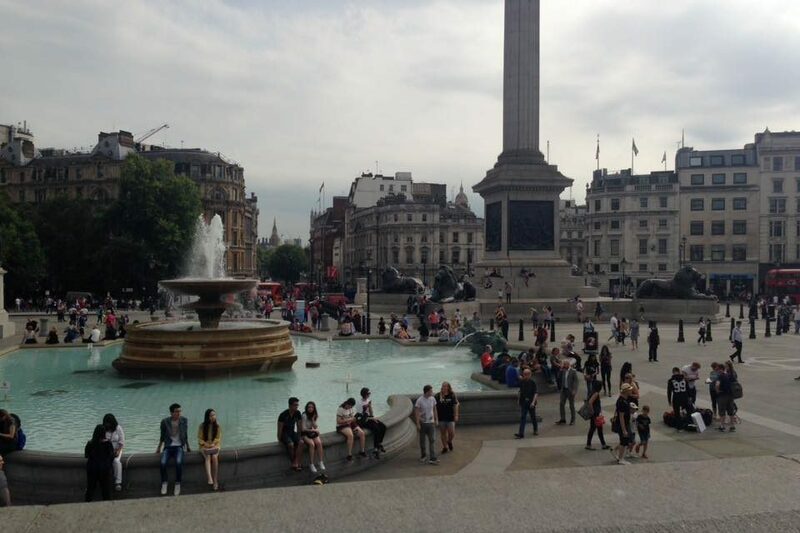 The beautiful sunny day meant people were enjoying the outdoors near the water fountains. Just outside the National Gallery, there were several artists that were drawing with chalk on the concrete. I apologize for the lack of photo’s taken during my visit. Each day flew by, where I was so focused and absorbing the moment, that I lost track of capturing every memory on photo. I had some great afternoons and evenings catching up with family and friends. I managed to grab some fish and chips, it’s one of the British foods I really miss! The fish and chips have to be like we had them growing up, from a local chip shop, wrapped in paper with lots of vinegar. I took away educational experience from a reputable art college, new art skills, lots of inspiration for new pieces for my British Fusion themed artwork, lots of colorful new props for future artwork, laughter, smiles and awesome memories!